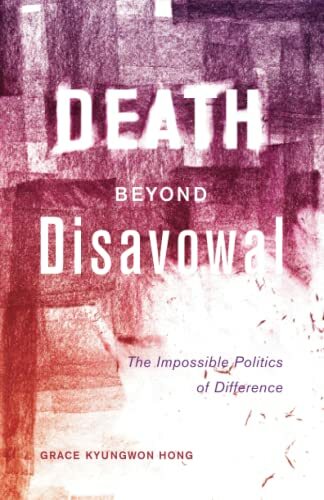 [PDF] Death beyond Disavowal: The Impossible Politics of Difference (Difference Incorporated) | Free eBooks Download - EBOOKEE! Description: Death beyond Disavowal utilizes â€œdifferenceâ€ as theorized by women of color feminists to analyze works of cultural production by people of color as expressing a powerful antidote to the erasures of contemporary neoliberalism. According to Grace Kyungwon Hong, neoliberalism is first and foremost a structure of disavowal enacted as a reaction to the successes of the movements for decolonization, desegregation, and liberation of the postâ€“World War II era. It emphasizes the selective and uneven affirmation and incorporation of subjects and ideas that were formerly categorically marginalized, particularly through invitation into reproductive respectability. It does so in order to suggest that racial, gendered, and sexualized violence and inequity are conditions of the past, rather than the foundations of contemporary neoliberalismâ€™s exacerbation of premature death. Neoliberal ideologies hold out the promise of protection from premature death in exchange for complicity with this pretense. In Audre Lordeâ€™s Sister Outsider, Cherrie Moragaâ€™s The Last Generation and Waiting in the Wings, Oscar Zeta Acostaâ€™s The Revolt of the Cockroach People, Ana Castilloâ€™s So Far from God, Gayl Jonesâ€™s Corregidora, Isaac Julienâ€™s Looking for Langston, Inge Blackmanâ€™s B. D. Women, Rodney Evansâ€™s Brother to Brother, and the work of the late Barbara Christian, Death beyond Disavowal finds the memories of death and precarity that neoliberal ideologies attempt to erase. Hong posits cultural production as a compelling rejoinder to neoliberalismâ€™s violences. She situates women of color feminism, often dismissed as narrow or limited in its effect, as a potent diagnosis of and alternative to such violences. And she argues for the importance of women of color feminism to any critical engagement with contemporary neoliberalism. No comments for "[PDF] Death beyond Disavowal: The Impossible Politics of Difference (Difference Incorporated)".